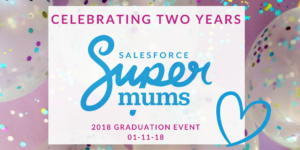 We were thrilled to be celebrating our second annual Supermums Graduation event at Salesforce Tower last week. We’ve chosen our best bits to share with you! 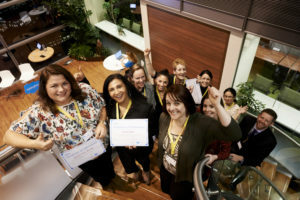 We were so pleased to welcome so many Salesforce Supermums (past and present), volunteers, supporters and the Supermums team to our evening event, which was kindly supported by Salesforce and hosted at the incredible Salesforce Towers, London. 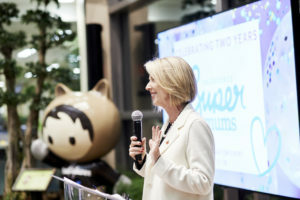 We celebrated with some motivational and inspirational words of support from Heather Black our Supermums founder, as well as hearing from our very special guests – Marie Hannigan, regional VP, Salesforce Platform Team and Gemma Emmett, Solution Architect Manager, Bluewolf and founder of the Ladies Be Architects group. Our Supermums graduates from the last years’ cohorts also received their certificates to commemorate their completion of the programme. 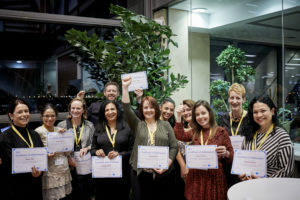 Simon des Forges, a Supermums graduate and Project Worker at Herts Viewpoint, also received an award of special thanks for his commitment to helping share success stories for the Supermums programme – you can watch his webinar here. We were excited to be able to stream the speakers and graduation ceremony on Facebook Live, and you can watch a recording of the event here. You can also browse all the photos from the event here (password is Supermums). If you’d like any of the photos from the event, please get in touch with us. Some Supermums stats we’re really proud of! Thinking about joining our Salesforce Supermums programme, either as a mum or a volunteer? Come over to our Facebook group and join us to find out what you can expect from being a part of our Supermums network! This entry was posted in Careers, Salesforce, Training, Uncategorized. Bookmark the permalink.